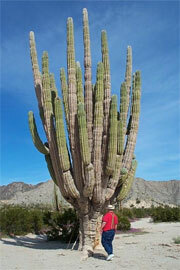 Cabo San Lucas has amazing Flora and Fauna and other amazing sights that can be seen on a Cabo San Lucas Ecology Tours. As you get to know Los Cabos more intimately, you'll desire a closer look at her mountain regions, desert and beaches, rock formations and fresh water estuary. ATV's can be rented at a variety of locations in the town of Cabo San Lucas. You can also take an ATV guided tour through the desert and along deserted beaches. Cabo is also a great place to see the migrating grey whale. Ask your concierge and they will be glad to set you up with one or more Cabo San Lucas Ecology tours. When you go on an Cabo San Lucas Ecology tour, you'll find much of the area is still undisturbed, the blue-green agave and giant cactus still dominating the land, that is used to make Tequila.